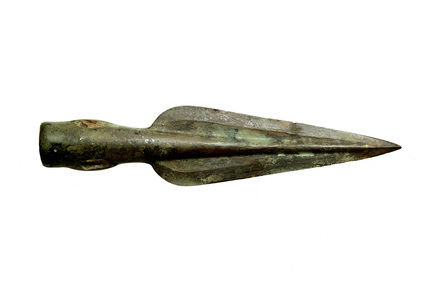 Bronze side-looped spearhead. The side-loops are modelled and protected by lozenge-shaped plates, while the socket mouth is defined by a carefully-modelled hollow collar or inset bevel. The piece has a dark brown-purple surface and is in robust condition. This spearhead was found on the modern foreshore with another bronze spearhead at Nine Elms, Vauxhall. They were amongst a number of substantial, paired round-wood piles, thought to be the remains of a Bronze Age jetty or bridge. The spearheads were possibly a personal arms hoard or hunting set.